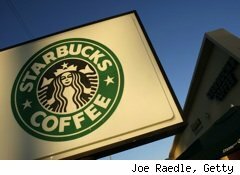 Perking for coffee giant Starbucks (SBUX) are its fiscal first quarter 2010 earnings, due to be reported Wednesday after the bell. All eyes are on the company's same-store sales, whose story over the past 12 months has been along the lines of "hey, we're not declining nearly as much as last year at this time!" The last quarter in which Starbucks experienced same-store sales growth was the first fiscal quarter of 2009, the three months ended Dec. 31, 2007.By the end of fiscal 2009 (quarter ended Sept. 30, 2009), things were not looking up, but the decline had slimmed to only 1% negative growth. Though this was hardly the sort of banner quarter investors would have heralded back in the stock's heyday, the reactions were overwhelmingly positive, lifting the stock from its depths below $10 to its current low-to-mid twenties. Back in the good old days, less than 4% year-over-year same store growth was a disappointment, causing the stock to plunge, and the price-to-earnings ratio was in the 50s. On Tuesday, the stock closed at $23.58, up $0.31 or 1.33%, on optimistic expectations. The trailing twelve-month P/E ratio is currently 39.42, a hefty number in today's economic climate. And analysts are expecting the company has finally turned around the slow boat of growth with the 2009 holiday season. In a note from Jefferies, says the Wall Street Journal's MarketBeat blog, 2% same-store growth is expected. Of course, this is in comparison to the first fiscal quarter of 2009, which was truly awful for Starbucks; same-store sales were down 9%. (The math is rough, but a 2% growth figure would represent somewhere around a 7.5% decline from the quarter ended December 2007.) Analyst consensus is the company will earn 27 cents a share, three times earnings in the first quarter of 2009, on revenue of $2.58 billion. Jefferies also was positive about the new pricing structure, first heralded in last year's second-quarter conference call and pumped up a week ago when the company lifted prices in New York City and Canada 5% to 10% for all coffee beverages. It also upgraded and increased prices for tea drinks and raised the costs of so-called "complex" beverages -- really the extras customers request, including extra espresso shots and flavored syrups -- by as much as 33%. The chain has also continued to refine its food offerings. In October 2008, it launched new "healthy" breakfast options, complete with good-for-Schwartz' heart oatmeal. As the fall of 2009 approached, so did budget-friendly "breakfast pairings," the equivalent of a value menu. In the summer of 2009, it was "Real Food. Simply Delicious," a Pollan-esque slogan meant to symbolize fewer, higher-quality ingredients with less chemicals and preservatives. This month, it's low-calorie offerings, including new paninis and a multi-use coupon in Sunday newspapers offering $1 off oatmeal and paninis through early March. Whatever else Starbucks can be accused of, it certainly is not resting. There's a new slogan for every season. Indeed, sentiment around the Street seemed rosy, in stark contrast to customer reactions, which were generally angry. Many very loyal customers -- those who visited so frequently they were willing to pay a $25 annual fee for special "black gold" reward club perks -- were annoyed on Dec. 26 when the company streamlined its rewards club offerings. It eliminated the 10% discount for black gold members and limited perks to the customers who used their registered, pre-paid Starbucks gift cards. Meanwhile, Glenn Curtis at Minyanville says his co-workers are just now starting to reach into their pockets for a "coin" to buy pastries and drinks at Starbucks in "multiple trips throughout the day." He's sure the company's many recent moves bode well. He particularly likes the hype around Via instant coffee (I'm less convinced, though I think the marketing is cute). Curtis vaguely says, "Just think about the sheer number of coffee drinkers who could jump into Starbucks' lengthy lines in the months to come." Not what you'd call "technical analysis," but still, he comes up with a prediction: 10% to 20% upside in the shares for the year. I'm not so optimistic; I worry that these suddenly unveiled price hikes, especially in the key (and already extremely pricey) New York market, are proof the company's sales are still slipping. I worry, further, that the chain won't find its demand is inelastic. Most of all, I worry that its perks aren't perky enough to overcome the still-frugal customer base. Growth, I fear, could be tenuous.